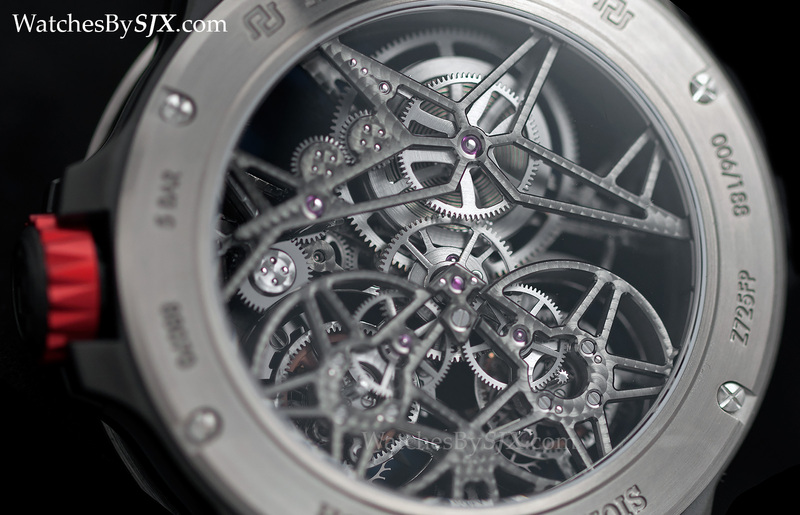 With a skeletonised movement and case, the Roger Dubuis Excalibur Spider Double Tourbillon combines the brand’s signature complication with a newly developed lightweight, open-worked case. 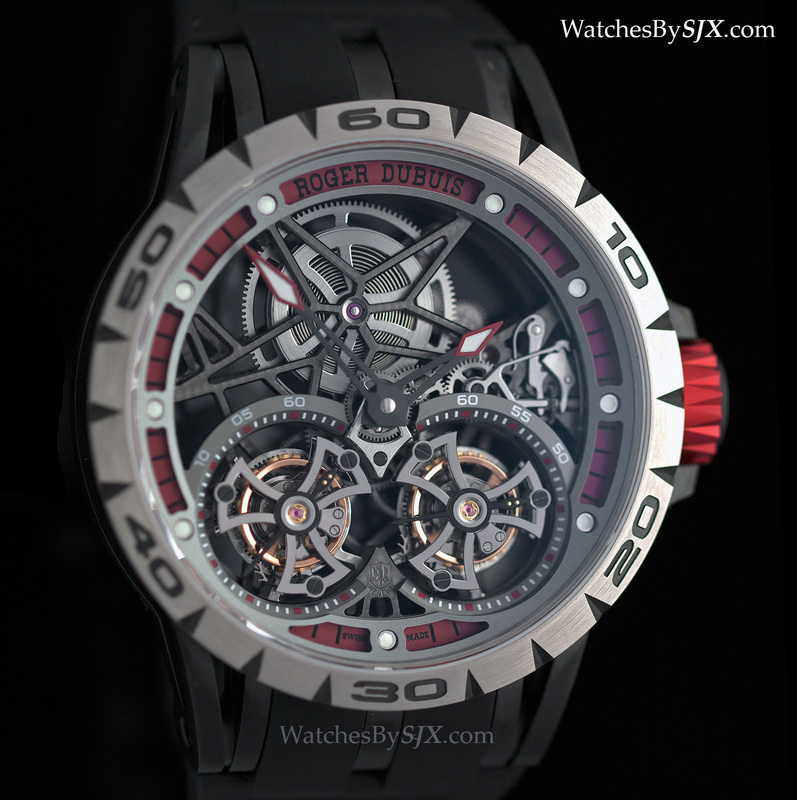 At SIHH 2015 Roger Dubuis introduced the Excalibur Spider, a skeletonised variant of the Excalibur case with its distinctive triple lugs. 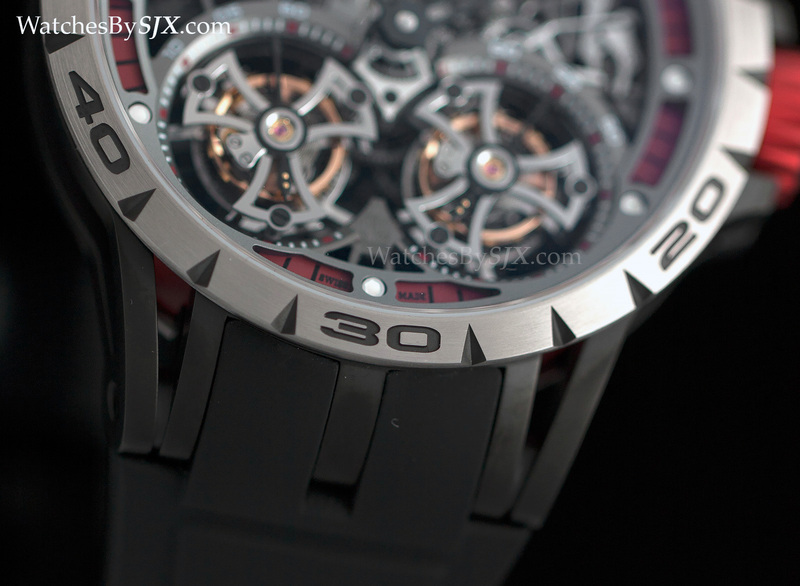 The top of the line model is the Excalibur Spider Double Tourbillon, equipped with Roger Dubuis‘ instantly recognisable open-worked tourbillon movement. The RD01SQ movement is hand-wound with twin tourbillon regulators, both one-minute tourbillons rotating in the same anticlockwise direction. 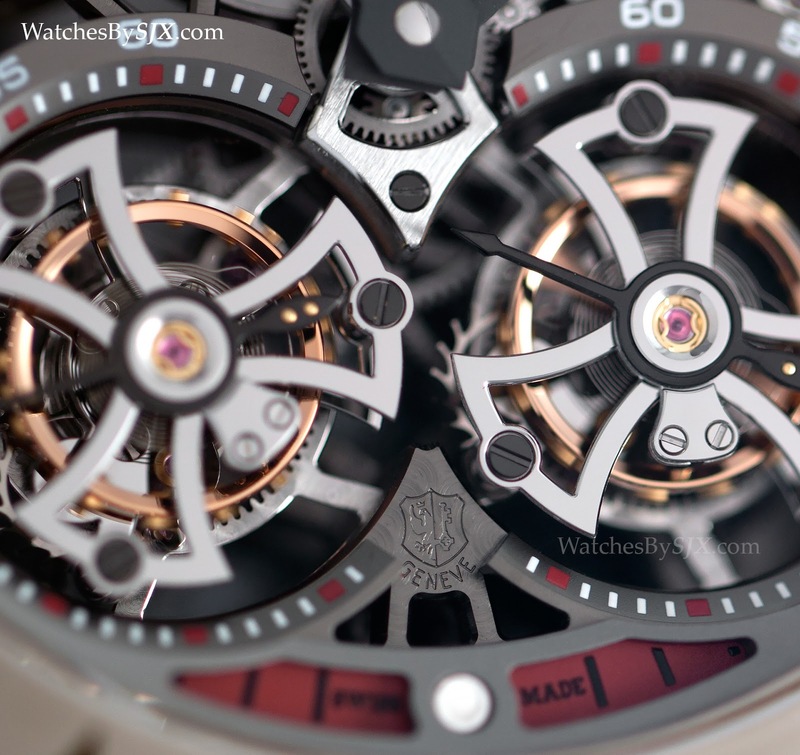 Most tourbillon wristwatches are made for visual appeal, and two tourbillons are much more appealing than one. 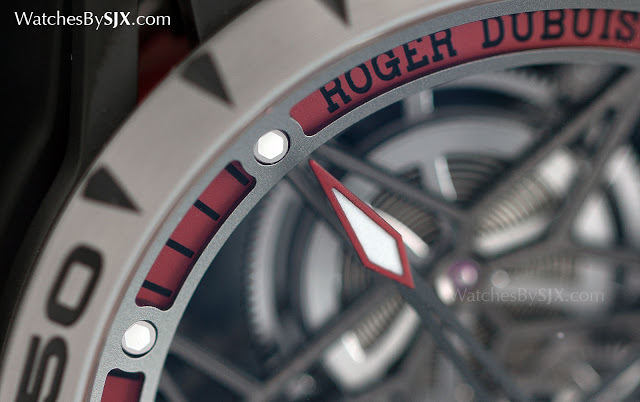 Though Roger Dubuis is not the only watch brand offering this complication, the double tourbillon has become synonymous with Roger Dubuis. The brand was one of the first to introduce such a movement, and more importantly has positioned it as its most important complication. 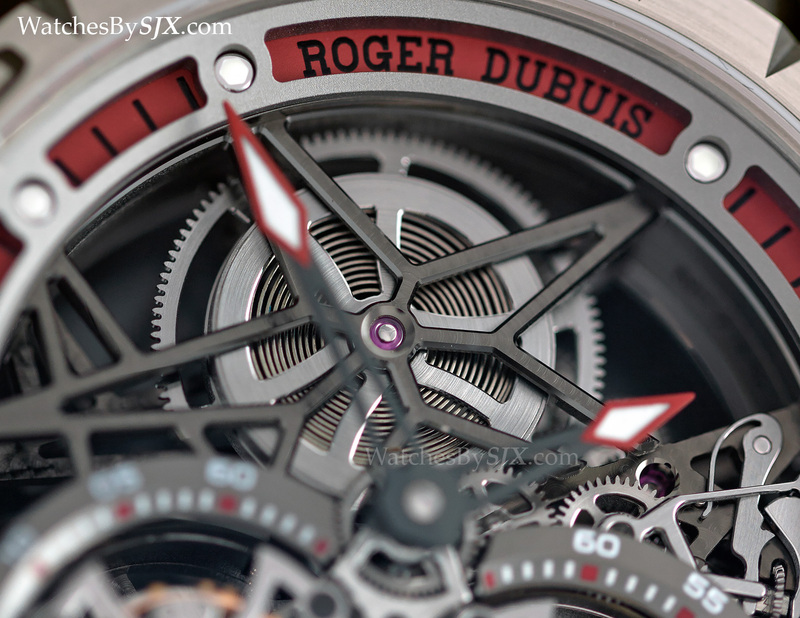 Like the rest of Roger Dubuis’ skeleton movements (including the single tourbillon), the double tourbillon calibre has the base plate skeletonised to form a large, five-pointed star on the front right above the barrel, with the mainspring exposed below. 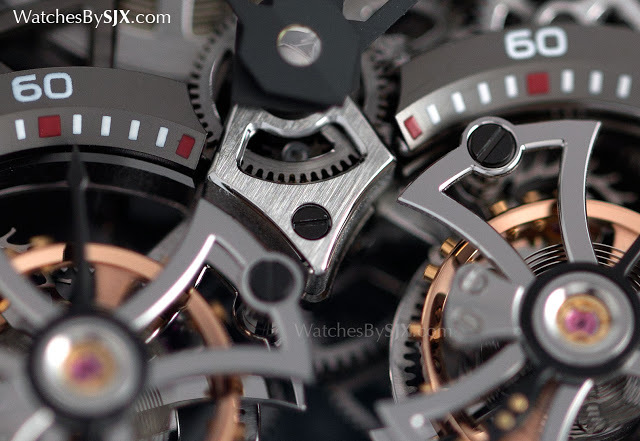 And there are another three stars on the back, with the gear train that transmits power to the twin tourbillons running between them. This star motif is instantly recognisable, and along with the Celtic Cross shape of the tourbillon cage, forms the key design element of the movement. All the slender arms of the stars, and in fact nearly ever surface of the movement, is decorated with perlage, a decorative technique of circular graining. Because the movement is coated with a dark grey metal, the perlage is not immediately apparent, but at certain angles sparkles as it catches the light. 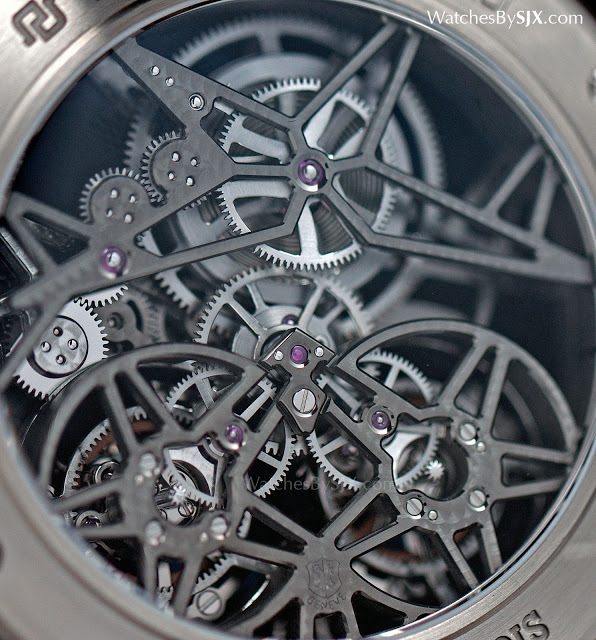 Like the movement, the Excalibur Spider case has been skeletonised. It still retains all the characteristic features of the Excalibur – triple lugs and a notched bezel – but most of the unnecessary material has been removed. The lugs and case band have been emptied out, making the case light, despite its large size with a 47mm diameter. 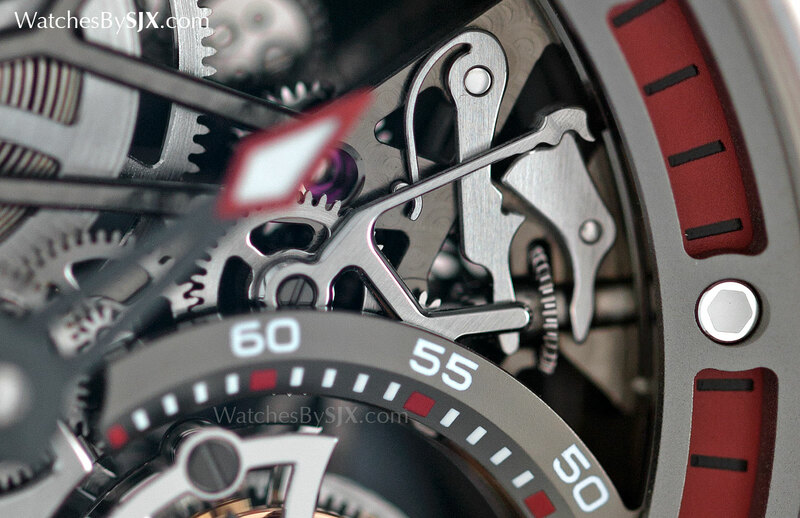 Red aluminium (a light alloy that can be anodised in bright colours) inserts decorate the crown, case band and dial flange. The overall look is striking, which is the point of just a watch. 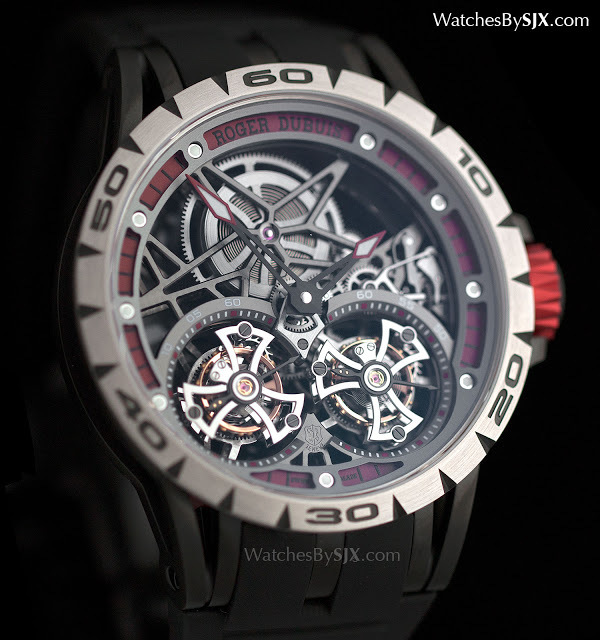 The Excalibur Spider Double Tourbillon is a limited edition of 188 pieces, with a retail price of US$298,500 or S$395,000.